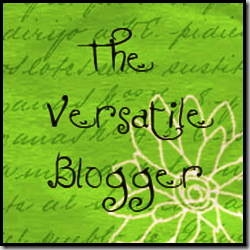 Last week I was given the Versatile Blogger award by two different bloggers! Can you say WOW!! I was so excited!! I am just so glad that I have readers, let alone being given wonderful awards! 1.) Thank the person who gave you the award and link back to them. 2.) Tell seven things about yourself. 1.) I am the person who would rather work by myself than with a group of people. This especially pertains to anything artsy or crafty! 2.) I am NOT a sports fan in any shape or form! 3.) My newest addiction is Cherry Dr. Pepper! 4.) 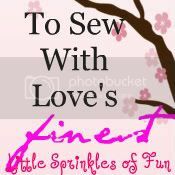 For the most part I have self-taught my self to sew. My mom does help me out when I am having trouble. However, this can be difficult through the phone! She lives 3 hours away! 5.) I would rather bake desserts than cook a meal. 6. )I am horrible at doing laundry! If it were not for my husband we would be in trouble! My multi-tasking falls short here! I tend to forget to move the clothes to the dryer! 7.) I LOVE MY FLIP-FLOPS!!! I hate it when my toes are squished into shoes! UGH! My feet and toes feel so FREE in my flip-flops! These are the awesome blogs that are receiving this award from me! !